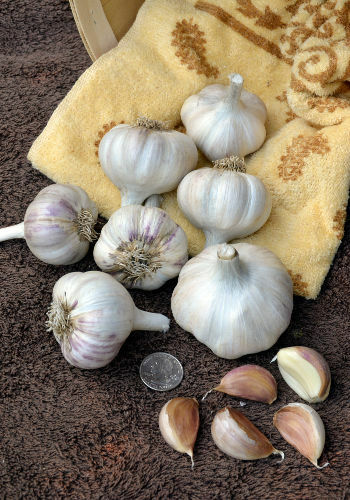 ((Ontario Giant)) This is a rocambole garlic from the Great Lakes region selected for its excellent disease resistance in heavier soils. It has an incredible depth of flavor making it an excellent choice for roasted garlic, pickles and everyday use. It peels easily so it is a good choice for fast meals. The largest bulbs last 3-4 months while the smallers ones last 8-9 months. 7-12 cloves per bulb.